Cross your ''Gene A.I.dols''Genes to get your originals. ZUG, SWITERLAND, February 14, 2019 /EINPresswire.com/ -- Token economy platform providing company ICOVO1 AG (Headquarter: Zug, Switzerland / CEO: Akihiro Yamase. Referred to as, ICOVO) is releasing Non- fungible Token platform soon in spring 2019. 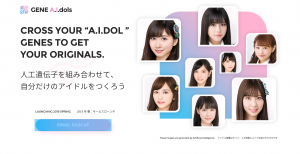 Furthermore, at the same time, we are also releasing its very first project of Token economy project, a Blockchain Dapp game “Gene A.I.dols2”, joining hands with alt Inc. (Headquarter: Chiyoda-Ku, Tokyo, Japan / CEO: Kazutaka Yonekura) and DataGrid Inc.(Headquarter: Kyoto, Japan / CEO: Yuuki Okada).